Valentine’s Day, Valentine’s Day. So joyously and miserably and infinitely nuanced. From the forlorn cursing the bitter injustice of it all to the goopy teenager so struck it feels like an out-of-body experience, one thing always holds true. And that it is the night of the year most hated by restaurateurs (we’ll leave you to dwell on why that might be). Actually, there’s another thing. Whatever the vicissitudes of romance, many of us have one central love in our lives, one that need not be unrequited or soppy, and one to which we can always retreat to should things become sour. That’s home – because home is where the heart is. 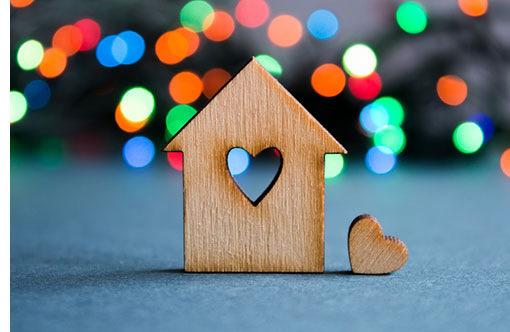 There’s no need for a psychological discourse on how important ‘home’ is to our sense of self and wellbeing, so today – on this day of love – we share five tips on how to love your house forever. What are you going to use the room for, first? An overheard the other day was, “one day, I’d love a dining room”. You sound like my nan was the instinctive response – as surely the days of formally defining space as kitchen, lounge, dining etc are long gone? (With the exception of the bathroom perhaps. You’re not likely to find the laptop set up in the smallest room). Because these days, especially in device-driven households, the boundaries between spaces have become impossibly blurred – we work in the lounge, we watch TV in the kitchen, we make movies in the bedroom (we’re talking YouTube vloggers here, OK). We eat at our desks, work out in the spare bedroom and play games at the kitchen table. Once you’ve considered the possibilities of function, and allowed for each, then decorate and furnish. It’ll make use of the home so much more pleasant and efficient later on. So every now and then, the home interest magazines will publish a reader’s home, celebrating their “quirky” style and their “charming” use of retro and hipsterly nonsensical “upcycling”. These are normally cues to expect an explosion in a paint factory, with a “rustic” (rusty) bread bin from a boot sale strategically placed on a work top or a bit of old plough in the fireplace. Yet there is something is this: choose something dramatic – a sofa, a picture, a bit of old plough – that can provide a dramatic focus to a space. Not just for conversations’ sake, but so you achieve impact without effort. But don’t, just don’t, overdo it. One Piece Only. Aligned to the that, and despite the chiding of upcycling above, one can be quirky, without being a loon, by imagining pieces – especially furniture – outside their traditional settings. Thus a fifties dressing table, with a tweak, could become a console unit in the hall; a daybed doubles as a sofa; or a contemporary desk finds its way into the bedroom to complement a modern Malmaison-esque boudoir. Don’t be rigid in your thinking. This’ll come as a blessing to those millennials who, so reputation nowadays has it, are averse to DIY, if not downright incompetent. Don’t nail, screw or hang anything on the walls anymore – use freestanding shelves and bookcases for display: whether knick-knacks, prints, photographs or basically anything that would have once involved a spirit level, drill or hammer. It will leave decorated walls in their untouched prime, and confer tons of flexibility when tastes and favours change. Light is key to our well-being and health, and every room should have four sources. The first of these is obviously the window – ideally a PVC-U flush sash item from our stunning Modus collection – yet, no matter how big or bright, it should always be augmented by an overhead pendant (the ‘big light’ in our house); something at eye-level, like a table or floor lamp; and a ‘wall-washer’ – uplighters to you and me, or sconces.